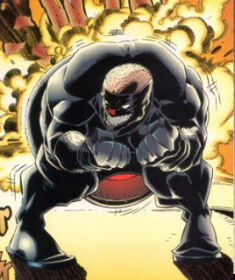 Backfire created by Erik Larsen, with help from Keith Giffen and Jeff Matsuda. Later on, Horde used the miniature Vicious Circle members to break into Stronghold Prison and release large numbers of supervillains. Body Function was some of these criminals and they soon joined Horde in time for his death at the hands of Dragon. Backfire returned many years after this as part of an army of Vicious Circle members led into battle by OverLord III against the Tyrrus Combine. He was killed alongside the rest of Body Function during the ensuing mayhem.